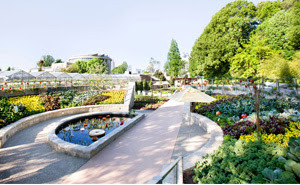 This month, Garden Design magazine featured two edible landscapes, highlighting the growing connections between designers and sustainable food projects. The projects fall at opposite ends of the spectrum of scale, goals and character, and indicate the potential for integrating agriculture into diverse project types. "Showcasing the farm-to-table concept of cultivating and consuming fresh, local and sustainably-grown food, the $2 million Edible Garden project not only returns the 1-acre asphalt parking lot to green space but also demonstrates that fruits and vegetables make beautiful landscape plants." As described in Garden Design, an orchard of crabapples marks the entrance to the garden, which features a "vegetable ampitheater" of raised, terraced beds, a walkway lined with espaliered fruit trees and a 55-foot long curved herb wall. Produce is harvested by local chefs and used in on-site cooking classes featuring dishes like farro, bok choy and pureed beets, and donated to local charities. 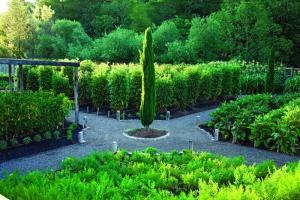 Across the country, on a private estate in Sonoma, California, a collaboration between a landscape designer, Mick Kopetsky of MIX Garden, and his client, a trained chef, resulted in a 2/3 acre kitchen garden, an orchard of olive trees yielding 10 gallons of oil a year and a vineyard of Syrah grapes. An exploration of equal parts design and farming, the resulting garden is beautiful and bountiful - extra produce is sold to local restaurants and caterers.